There are so many things to discuss in regards to a new Blind Guardian album that I had trouble deciding where to begin. I settled on getting the obvious stuff out of the way first, namely, that four years (five on paper) has yet again separated their newest effort from its predecessor, in this case 2010’s highly acclaimed At the Edge Of Time. 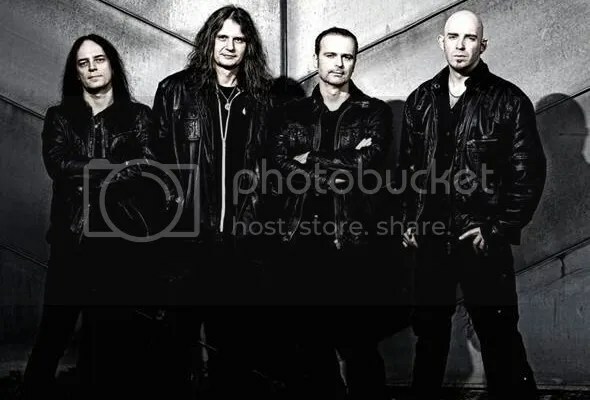 Four years in the rock and metal world is twice as long as the average 2-3 year gap between most artists’ releases, but the extended length of time for Blind Guardian is reasonably well accounted for: Multiple leg world tours take up a year and a half or more, and the writing, recording/production of one of their albums requires a longer gestation period than your typical meat n’ potatoes metal band. They’re not quite the obsessive perfectionists ala Axl Rose or Wintersun’s Jari Maenpaa, nor do they have the lackadaisical attitude of Tool, whom seem to regard new albums as a chore (and whose results have yet to justify the excessive time taken); no Blind Guardian are actually working productively in some form or fashion in the period between album releases, and fans have grudgingly gotten accustomed to these lengthy wait times ever since 1998. This longer wait between albums most obviously raises anticipation, but I often wonder if it distorts expectations as well. Take At the Edge of Time for example, it was viewed as a return to form, a sort of throwback to their early 90s speed/lean metal approach combined with a grand orchestral backdrop that made it both their most hard hitting work in a decade as well as their most atmospherically epic. It was a complete 180° from the stripped down experimentation of A Twist in the Myth, itself a departure from A Night At the Opera’s grandiose excess. I can personally attest that the musical changes present in each of these four albums came as a surprise upon their release; there was little to nothing in each of their predecessors that would’ve foreshadowed those changes. I suspect its why At the Edge of the Time was so warmly received, because it differed so much from A Twist in the Myth’s odd blending of hard rock inspired sounds, toned down arrangements, and accessible songwriting. After four years of sporadic attempts at getting more into Myth’s eccentricities with partial success, I was blown away by the vastly different flavor of Blind Guardian that At the Edge of Time was presenting, in a very good way that is. For better and worse a Blind Guardian fan’s post-2006 dilemma is that we’re unable to foreshadow what the bards will do next, because unlike most other bands they don’t gradually phase-in change over successive albums released in shorter intervals. Quite contrarily, Blind Guardian shifts their approach rather wildly and with zero mechanisms for forewarning, and as fans our last impression of what they did musically is already four years old (at least!) by the time something new comes around —- its why “And Then There Was Silence” was such a shock to the system when it was released as a single in 2002. When had you ever heard anything like that in the band’s bag of tricks? Never is the answer. Four years is long enough for the band to internally develop a new direction, but its also long enough for fans to tend to lose a sense of context in regards to what modern Blind Guardian should, or more importantly, could sound like. Its the price you pay for brilliance —- if Hansi Kursch and Andre Olbrich need two and a half years to write and record another great album as opposed to six to eight months, who are we to question their methods? I mention all that because chances are that when you first hear Beyond the Red Mirror, the band’s tenth studio album in their now twenty-five year plus career, you’re liable to ask yourself just what am I listening to now? What you’re listening to is the most asymmetrically complex album that Blind Guardian have ever written, with songwriting that makes the tunes on At the Edge of Time seem poppy in comparison. Upon your first few listens, you’ll find it difficult to discern melodies, patterns, or anything resembling a prototypical hook throughout a large chunk of the album. I certainly did, but this being a new Blind Guardian album, you’ve gotta give it the extra time and attention it deserves and treat yourself to many repeat spins in order to let the experience sink in, wash over you, or whatever metaphor you subscribe to. Its another in a long line of surprises that have come with each of their past five releases, and the band offers no apologies, this is the music they came up with and you can take it or leave it. If you’re still having trouble digesting what you’re hearing, perhaps it might help to frame the album as a mix of A Night at the Opera’s songwriting complexity with At the Edge of Time’s orchestral/choral bombast. Andre packs in the aggressive riffs and wild melodic zig-zags as only he can, but they’re denser, closer together, less anthemic and structured more as swirling patterns that support Hansi’s vocals, which drive the bulk of the melodies in these songs. 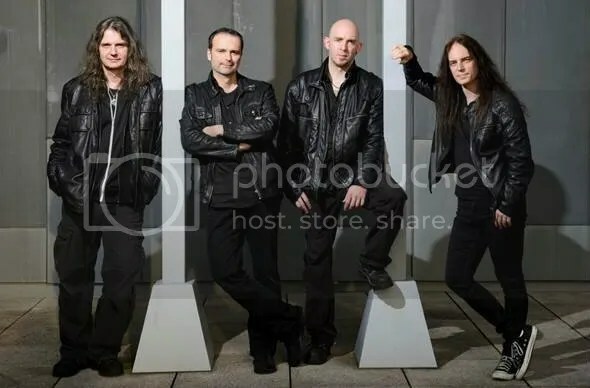 Typically, a Blind Guardian song finds its balance between the melody being ushered along in equal parts by Andre and Hansi working in tandem (usually in the case of the vocals picking up where the guitars leave off during the chorus) —- except in the case of A Night at the Opera and this album, where Hansi’s vocals serve as the primary driving melodic thru-line for the song, the instrumentation left to play around it. It may seem a strange call back, a 2015 release sharing something so structurally important with an album released in 2002, and I don’t really have an explanation for why it worked out that way. I’m guessing that the band doesn’t either. What this means of course is that you won’t find a direct spiritual successor to At the Edge of Time’s anthemic “Tanelorn”, or “Wheel of Time”, but you’ll find bits and pieces that remind you of them. Take the most radical song, the lead off nine-minute epic “The Ninth Wave”, where a solo choir intro clashes with futuristic sound effects, a strangely affecting buildup that helps to unleash one of the most purely anthemic choruses on the album. Hansi’s jump back in after the first chorus is equally dramatic as he shouts “To Muriel’s fire, walk with me!”, one of those fist-raising moments that you’ll get at least a few times an album with these guys. Andre’s extended guitar passages in the middle of the song are a treat, full of explosive solos and lead runs that rocket away from any motifs heard before within the song, a brave thing to do when the easier way out would be simply mimicking the vocal melody. The other equally radical epic is the concluding song, “The Grand Parade”, a waltzing semi-power ballad that skips along on Frederik Ehmke’s rhythmic percussion and a gorgeous orchestral arrangement where strings and horns chime together in opulent fashion. Here Andre and fellow guitarist Marcus Siepen eschew riffs in favor of long Brian May-esque sustains, channeling their Queen fandom to its expressive best, suitable for a song that sounds like a celebration. This one took me awhile to wrap my head around, but its become one of my favorites on the album not only for its awesome, majestic chorus, but simply for the fact that its such an unusual Blind Guardian song. Unusually, “The Ninth Wave” and “The Grand Parade” share a length of exactly 9:30, serving as symmetrical bookends —- whether that is by design or sheer accident is a mystery, but this is a concept album after all (more on that in a bit) so its worth noting. Another one that took me a touch longer to get into was the song “At the Edge of Time” (I’ve read an interview where Hansi speaks on why they titled a song after their last album, but its a bit difficult to summarize in a sentence, suffice to say there IS a reason). The song starts out with an intro that features one of the album’s singular shining moments, at the :57 second mark, Hansi beautifully dreams out the lyrics “Who’ll grant me wings to fly? / And will I have another try?”. Its a simple lyric on the surface, but its unanswerable question is evocative in the very essence of what its asking —- and Hansi’s phrasing and emotive delivery just bowls me over every time I hear it. Moments like that are what I wish I could instantly summon whenever someone asks me why Blind Guardian is so great (if I haven’t slapped them across the head by then). Perhaps the song I still have trouble with is “Sacred Mind”, particularly in the chorus where I get the feeling Hansi might’ve over sung just a touch. Its not a bad song by any means, but there’s a monotone-ness to the chorus melody that prevents the song from reaching a higher emotional place. Of course, some songs are easier to crack than others, such as the advance single “Twilight of the Gods”, which sounds grander, bolder, and more punchy here than on the YouTube lyric video release (its time for labels to reconsider the low quality of their lyric video uploads). The limited edition/vinyl copy of the album has an additional song within the middle of the track listing called “Distant Memories”, a beautifully lush and wonderfully written power ballad in the vein of “Noldor” and “War of the Thrones”. Why this song was kept as an exclusive track and not featured on the jewel case edition of the album is kind of a head scratcher, because its one of the most instantly accessible songs here. Hansi’s vocal is almost aching in the refrain where he sings “They’re just caught in distant memories /Then these fools will fade away / They may not fear the fall”. Its quickly become a favorite of mine and that shouldn’t come as a surprise to some of you, knowing that I’m a sucker for ballads. Other favorite moments… lets see, how about the entirety of “The Holy Grail”, the heaviest and fastest song on the album, where you get a “Tanelorn” meets “A Voice in the Dark” vibe. I love the way the choral chant of “Magna eterna! /Magna eterna sings!” sounds a lot like “Run like hell now! Run like hell now!” (or is that just me?). Then there’s the sneakily catchy “Ashes of Eternity”, a song that grows on you after many listens and features one of those aforementioned shining moments of pure brilliance, towards its end at the 4:23 mark when Hansi exults “I won’t lie / While bright eyes are turning pale / Your sands run low”. Not only is the callback to “Bright Eyes” something that makes you smile, but the delivery of that lyric and its subsequent passage is so dramatic in its timing, its placement, and its execution that it makes you wish it was the chorus of the song and not just an isolated moment. And of course, I have to mention the delicate intro to “Miracle Machine”, where Hansi sings over a lonely sounding piano, only backed up by his own multi-tracked vocals. I quite like the song, though in Blind Guardian’s piano ballad history it falls short of the standards set by “War of the Thrones” and “The Eldar”. Saving the best for last, there’s my two favorite songs on the album, “The Throne” and “Prophecies”. The former is a seven minute masterpiece; a perfect storm of great riffs, battle horns, Hollywood symphonics, and angelic choral sections. It also boasts the album’s most ear wormy chorus amidst all that bombast, a simple couplet that is simultaneously catchy and pulse pounding, “We must serve the fire / We must confess we are liars!”. Its on a level of excellence as that of “Wheel of Time” or “Sacred Worlds” from At the Edge of Time, one of those all too perfect gems where the verses are as compelling as the mighty refrain. “Prophecies” is a perfectly crafted case study in mid-tempo understatement, where the line between verse and chorus is blurred as a result of Hansi’s almost effortless lead vocal —- his narrative voice here is the song’s greatest strength, the backup vocalists only chiming in to punctuate specific lines in the refrain. Its worth noting that “Prophecies” was initially my least favorite song after my first few listens of the album, probably due to my thinking that its lack of any kind of build up suggested a directionless nature. Your favorites will likely change in similarly tumultuous fashion. If you didn’t know by now, Beyond the Red Mirror is a concept album in the vein of Nightfall, a song by song unfolding of a storyline. Its connected to the song “As the Story Ends” from the Imaginations album, and deals with the consequences of a boy who refused to jump through a portal to another world. In the digibook edition of the album, the band provides beautiful artwork that is directly tied into the fantastical concept of this album. There’s also a few lengthy short stories and poetic etchings courtesy of Hansi that serve as narrative guides —- they’re interesting reading, although I should probably emphasize that this is all entirely optional on your part. Enjoying the album as an aural experience alone is a viable option, but if you want to delve into the conceptual storyline there’s plenty to tuck into. I’ve given it all a few looks and read a thread on the band’s official forum that dissected it further, but the discussion participants were still having disagreements on just how the story fits together so I suppose I’ll just wait for them to hash it all out (hey I’m already behind on other albums!). A few days after getting the album, I tweeted out that people should have patience and not give up if they were having difficulty getting into it. Now, more than twenty-five complete playthroughs later I can’t emphasize enough just how dependent this album is on your ability to press play once more. Listen after listen, songs that went right past me began to open up bit by bit, like peeling the layers off an onion. This is Blind Guardian’s most inaccessible album alongside A Night at the Opera in that its so deeply intricate that your brain needs time to interpret everything its hearing, a process that by definition requires repeat listens. The opposite of pop music then. 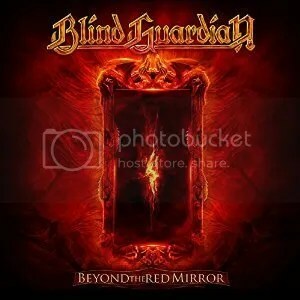 But despite its inaccessibility, Beyond the Red Mirror is also perhaps their most rewarding album. I’m at a loss to explain how a band on their tenth album begins to make the most challenging music of their career, because things don’t usually work that way. Nor am I at that point yet where I can honestly say that this is my favorite Blind Guardian album, or even that I enjoy it more than At the Edge of Time —- which I love a thousand times over. But there’s something here that will undoubtedly keep me coming back, perhaps secrets that I haven’t uncovered just yet. Without following the online forums or anything like that, I’ve got to say that the story behind the music is utterly lost on me. I read that some sort of seed for it had already been planted on “Imaginations…” (who’d have known! ), but even after reading the SE booklet’s prose I have no idea what’s going on. That being said, I pretty much agree with everything you write. I like”AtEoT” a lot, but it feels somewhat like a pastiche of earlier styles. This album is wholly new and sounds much more confident, I think. Interesting take on AtEoT, I suppose it could be thought of that way, but there was enough new stuff going on (the orchestrations, the choir integration) that it seemed vibrant and fresh. Not to mention that I felt the songs on the album were some of the strongest in years. I think most people are looking at the new album coming off the “high expectations” of the last album, and that may work against their initial opinion of Beyond the Red Mirror at first. So far (I’ve been listening for a few days, you were definitely right about the density MP) Beyond… feels a lot like a sequel to A Night… to me. ANATO now feels simple and direct in comparison, but it’s the free-flowing and layered musical approach that connects those albums in my ears. I’m enjoying Beyond more with each spin but I do think there’s some criticism to be made. For a band this exerienced BG really seem to be prone to excess. To start with, the album feels definitely overloaded with vocals, especially the choral ones. This ‘everything more epic than everything else’ approach does blunt the overall effect somewhat, the backing vox don’t get to make a dramatic, earth-shattering entrance since as the pieces are already saturated with them. Secondly, the meandering compositional approach doesn’t allow for enough separation and highlighting of key passages. Some of the more gripping parts really deserve to be placed on a musical pedestal, allowing the flow of the piece to draw attention to them. Instead it feels they are often allowed to slip past unnoticed. The arrangements don’t have much room to breathe and dont’t put a sharp contrast between different song parts. And finally the sound production is a little muffled and indistinct to my ears. So while I appreciate the ambition and tremendously enjoy pieces such as The Holy Grail and The Throne I find that the problems I mentioned, which I believe by some online reactions to be obvious to many listeners, do hold the album back for me. I actually do agree with a great deal of your criticism, especially your observation that the overloaded backing vocals (whether multitracked Hansi or choral sections) tend to lessen their impact overall, like a cake with too much frosting (could be a bad analogy, who doesn’t love frosting?). I was driving home today and was listening to “A Past and Future Secret” off the remixed Imaginations album and even in its cleaned up, crystal-clear state, I was struck by how powerful those distant background scream/sung vocals (“I will wait and guard the future king’s crown” and later “It was nice but now its gone” and “My song of the end!”) are simply because they’re such isolated moments of power. More recently, on At the Edge of Time’s “War of the Thrones”, there’s a rather incredible use of backing/layered vocals towards the end of the song during the “Leave a fee for the tillerman / And the river behind) where they work as a lengthy extension of the last word “behind” in the lyric and bend it melodically, like squeezing all the emotion they can out of it. Its probably my favorite moment on that album, so full of triumph and grandeur, and unfortunately, the new album seems to lack something like that (although as I pointed out in the review, there are still some incredible moments on offer). I don’t know, I had a feeling going in that it was going to be a slightly biased review, I’m always inclined to give Blind Guardian the benefit of the doubt. It took me awhile to reconcile myself to the reality that I only enjoyed a little over half of A Twist in the Myth for example —– that being said, I really have enjoyed the new album quite a bit, but maybe I’m 30ish odd playthroughs too close to it right now. I’m actually going to give it a break for a little bit and come back to it a few weeks from now and see how it holds up. Two birds thing, prevent myself from burning out on it as well as freeing up time to listen to other new albums! I don’t know if you listen to the MSRcast podcast that I co-host, but on our next episode myself and Cary (the other host) will finally get a chance to talk about the new album together and I’ll bring up your criticism and we’ll bat it around. Should make for interesting discussion! I didn’t know about your podcast! I’ll give it a listen It’s a great catch with the ‘Who’ll grant me wings to fly?’, it’s the closest moment so far to giving me the chills on Beyond. At the risk of getting slapped across the head, this is actually the first Blind Guardian album I’ve ever heard. Power metal has never been my thing and symphonic power metal even less so. I just assumed that Blind Guardian weren’t for me. Anyway, I’m kind of in love with this album at the moment. Thanks for helping me see the light. In the case of Blind Guardian, I’ll have to say better late than never, although perhaps you should reevaluate any metal listening friends you may have based on their NOT recommending this band to you earlier (or you know, forcibly getting you to listen to them). This is an interesting album for a new fan to come on board with…. I’d almost wish you stumbled onto their last album At the Edge of Time which was a bit easier to handle. You do owe it to yourself to check out the bands classics from the 90s, try Imaginations from the Other Side or Somewhere Far Beyond or even Nightfall in Middle Earth (the Tolkien Silmarillion concept album) —- either one should be enough to cement you permanently as one of us! Yeah, I blame my brother. I swear he sometimes holds out on me for his own amusement. I’ll definitely be working my way through their catalog. Thanks for the suggestions. Hmm, now that i got the chance to spin this album a few times, i can’t say i agree with you, about this album beeing not quite what we’re used to get from them, about not beeing a classic – give it some time. In my opinion this album isn’t at all that different from what i’m usually used to listen to from them, but then again i guess it all about what makes Blind Guardian to be Blind Guardian for you. 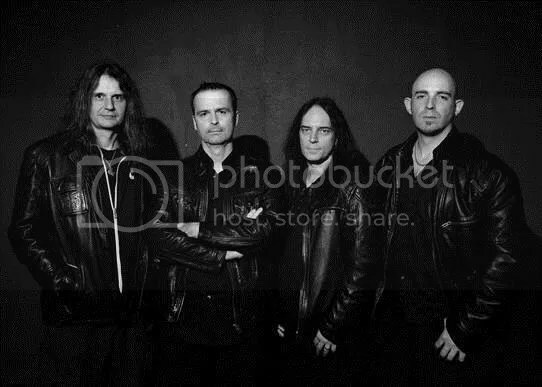 Personally I always asociated Hansi’s voice with them, almost like he’s their trademark, he simply is Blind Guardian for me, his vocal tone is unique from my point of view and i haven’t heard another voice quite like his. But then, i guess that if you’re used to associate their instrumental part (mostly) to what it makes them BD for you, then you would be right, they’re definitely going to sound different and even a bit odd in Beyond The Red Mirror. That beeing said i have to mention that i really love this album. I got hooked up by the opening chorus in The Ninth Wave (i have a thing for that kind of choruses), fell in love with Distant Memories and Miracle Machine (weak spot for symphonic ballads, let’s face it i’m a sucker for them) and i was completely smitten by the oddball of a song that is Prophecies. I do however feel that sometimes the instrumental parts overwhelm and cover Hansi’s voice and that a bit of a bummer, but it’s nothing that i can’t get over. Alot of what went into my saying the new album was a departure in some respects is fueled in large part by the polarizing opinions the new album is having on people. I guess I’m more talking to the people that are finding the album very alien sounding and difficult to “get into”. Of course I believe that the span of time in between albums contributes to the way Blind Guardian fans manage their expectations, and Blind Guardians own track record of classics works against their new albums in a slight way. When a fan spins the new album the first few times, he/she might have trouble accessing it and instantly compares it negatively to all those great albums in the past —– my emphasis in the review was the say, the Beyond is a new path for Blind Guardian in that the greatness is there, its just presented in a far more layered and complex way (complex in terms of song structures at least! ), so people need to give it time to reveal itself (in all its glory!). Agreed about the instrumental parts overwhelming Hansi’s voice, sometimes I wish they’d scale down the amount of layering they do all around, heck, even the vocal layering can be overkill if they do it both the verses and chorus. A small complaint however.